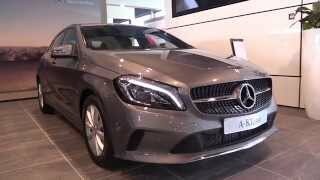 At the 2015 Frankfurt Motor Show, Mercedes presented the third generation of its A-Class models by unveiling the all new Mercedes Benz A-Class 2016. The model offers wide range of engine options and is housed with great connectivity and safety features that will make your ride memorable. 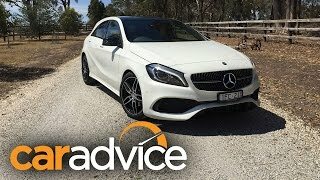 Let us have a look at the review of Mercedes Benz A-Class 2016 to know in details about each of them. The interior of Mercedes Benz A-Class 2016 might not feature rounds of changes but a close inspection will highlight a few of them. Starting with the instrument cluster which has new dial graphics which can also be had with a new eight-inch screen as free standing display. Seats are created in a way that they offer cushion depth adjustment to up to 2.3 inches and the exclusive package and the seat design with red/green highlights make the interior look better. There is also a Motorsport Edition in which the air vents are surrounded by Petrol Green and the same essence follows in form of stitching over the sears and the armrest. 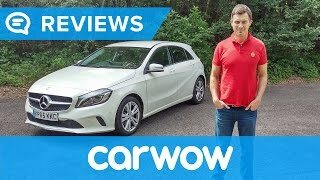 In all though the interior of Mercedes Benz A-Class 2016 has subtle changes but those integrated undoubtedly make it stand a lap ahead of its predecessors. 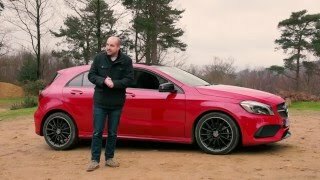 While talking about the exterior of Mercedes Benz A-Class 2016 I won’t say it a complete overhaul, as the facelift is not changed. I take this as a positive sign in the overall appearance of the model. Starting with the front fascia we no longer have the two-slat grille as it got replaced by a diamond pattern piece and in fact a close inspection will highlight change in the shape of the grille as well. The grille sits amidst the new headlamps that feature LED strips at both the sides while the bumper too gets some massive changes. Especially the air dam, that is taller and shorter and the side intakes that get a smaller shape and a vertical stance. Moving towards the rear you’ll notice the arched beltline and side skirts while the rear bumper comes with integrated exhaust tips and revised LED taillights. 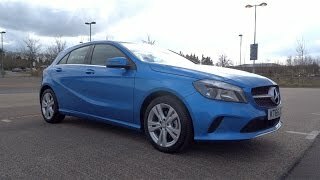 In all the exterior details of Mercedes Benz A-Class 2016 feature more attractive design to grab the attention on streets and keep the legacy of the company. Beneath the hood of Mercedes Benz A-Class 2016 are five diesel and six petrol engine options. Let us talk about the diesel engines integrated in A 160 d, A 180 d, A 180 d BEE1, A 200 d/A 200 d 4 MATIC and A 220 d/A 220 d 4 MATIC. The former three come with 1.5 liter displacement while the later two with 2.2 liter. Talking about the total output, the engines produce 90 hp, 109 hp, 109 hp, 136 hp and 177 hp respectively and the peak torque of 240 nm, 260 nm, 260 nm, 300 nm and 350 nm respectively. Coming over to the diesel lineup we have the above five (excluding the last ‘d’) and an extra addition with the A 250 4MATIC/A 250. Carrying the same sequence let us talk about the total output of the engines; 102 hp, 122 hp, 122 hp, 156 hp, 184 hp and 211 hp respectively and the peak torque of 180 nm, 200 nm, 200 nm, 250 nm, 300 nm and 350 nm respectively.